How many times do we hold on to the things we want in this life, not realizing that God might have bigger, better plans for us? 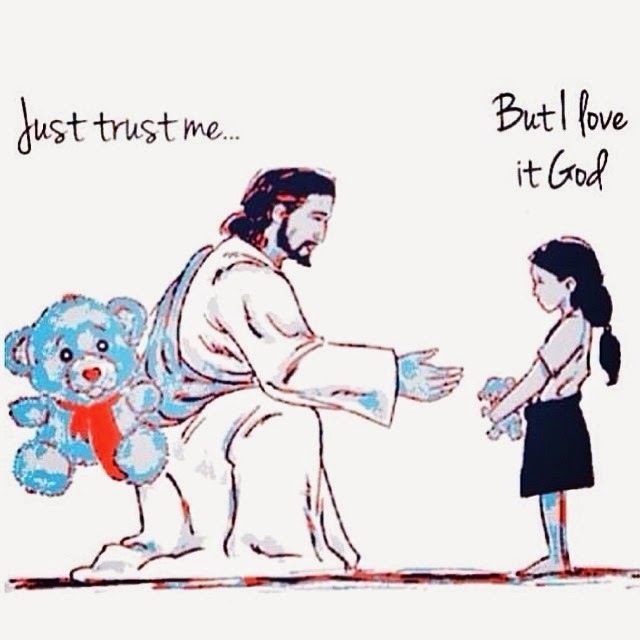 I found this drawing circulating on the internet, and I thought it was the perfect representation of how we often do not put our trust in God. I do not know who created this beautiful little drawing, but I have the Google link above (if any of you know where this originated, please let me know so I can give credit). So many people view God as some big wish-granting daddy in the sky who will bless them because they prayed and read the Bible. It’s not that God doesn’t want to bless you or give you the things you want, it’s just that what you want might not be what’s best for you. In Matthew chapter seven, we find Jesus giving a sermon on the mountainside to a large crowd. Many of us recognize the “Ask, Seek, Knock” speech as the message that God will give us what we pray for if we ask for it fervently. But if you pay close attention to the wording of the scripture, you see a new perspective. You see, God is not going to give us just any gift we may want; He’s going to give us good gifts— ones that he ordained for our lives. Jesus compares the gifts our heavenly Father gives us to the ones we give our earthly children. Say a child really wanted a present that wasn’t appropriate for her. Good parents would be wise enough to not give their child that gift, but to get her something better that she could enjoy without danger. The child might be upset that she didn’t get her way at first, but sooner or later, she will see that what she wanted really wasn’t the best thing for her life. God does the same thing with us. We might want to keep that boyfriend or girlfriend, even though God says they’re not the one for us. We might want that job, even though God says He has a better job for us. We might want healing or deliverance at this very hour, even though God says He’s not done working in us. Sometimes He asks us to give up what we think we want most for something better that He has in store. 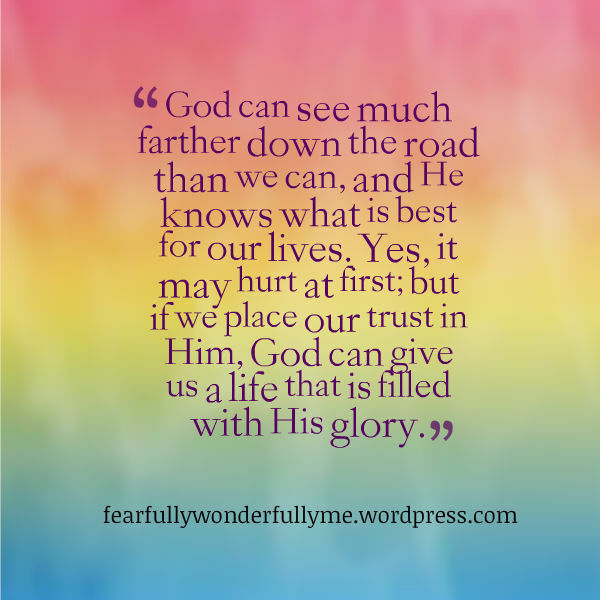 God can see much farther down the road than we can, and He knows what is best for our lives. Yes, it may hurt at first; but if we place our trust in Him, God can give us a life that is filled with His glory. That’s amazing news! As a child of Christ, you can have a waterfall of peace and love in your life just by trusting God. We have to remember that you can’t earn God’s blessings in life; Jesus already did enough when He died on the cross for you. Your trust in God must be built upon your faith. Study the Bible daily and pray throughout your day. Remember, you can ask God anything and tell Him what you want. He loves you and wants to hear from you. Sadly, I believe that a lot of us do not bother to tell God about the “little things” going on in our lives because of how mighty He is. God is not just the Lord of the big things in our lives, He is the Lord over everything in our lives– even the little, everyday things. When we start to really communicate with God and build a relationship with Him, then we can start to discover what His will is for our lives. We may not know immediately what the future holds or what decision we should make, but if we keep praying and wait for God’s answer, sure enough He will come through. God is watching over you, and He loves you very much– there’s nothing you can do to change that. So put your faith in Him and be willing to give up the parts of your life He may be asking you to surrender. God’s blessings are far greater than anything this world can offer. Praise the Lord! I’m so happy I could be a part of that. thank you for this wonderful message. will follow your advise into surrendering to God even the little things. That’s great Hazel! I’m so glad you liked it.